Zipf's Law: Number 1 in any market gets a disproportionate share of the rewards - whether you're talking about opera singers or ice cream. 'Best' is subjective - decided by the customer. The market is getting bigger - I can find my exact preference anywhere on the planet. And at same time the world is getting smaller and more specialized - I can the best gluten-free baby food available by overnight shipping. So while it's more important than ever to be the best in the world, it's also easier - if you pick the right thing to do and do it well. Just about everything you learned in school is wrong. The very successful are not the ones who are well-rounded. They are the ones who are excellent at the skill they specialize in. 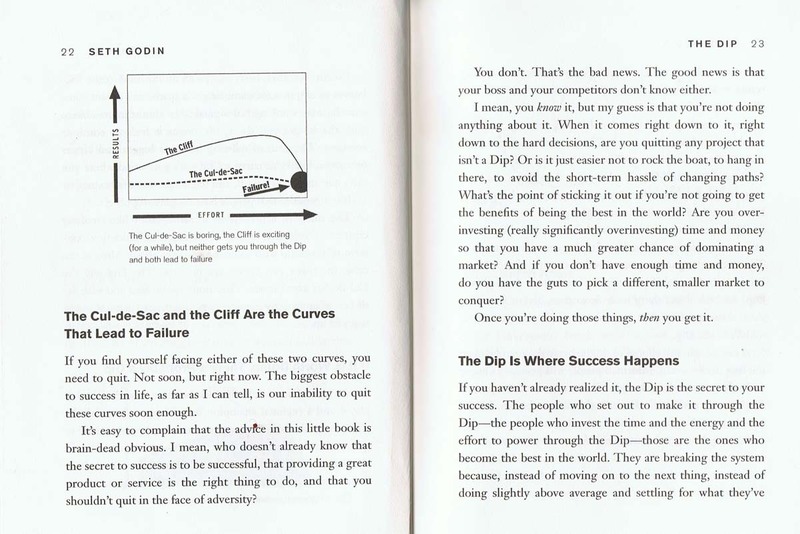 Everything worth doing is controlled by The Dip. When you first start something, it's fun. The rapid learning and encouragement from others keeps it interesting. But then you hit The Dip - the long slog between starting and mastery. It can be physical - training your body to reproduce perfect golf shots. It can be bureaucratic - force you to jump through licencing hurdles to discourage all but the very motivated. It can be academic - make aspiring doctors pass the killer organic chemistry class to screen out the less smart. Lots of people aspire to the power and wealth of CEO's, but you'll find that each of them spent 20 or so years working longer hours than everyone else, kissing up his current boss, day in and day out, year after year. It's hard to get there.If it was easy, there'd be too many people vying for the job, and there wouldn't be scarcity value to justify the high pay. 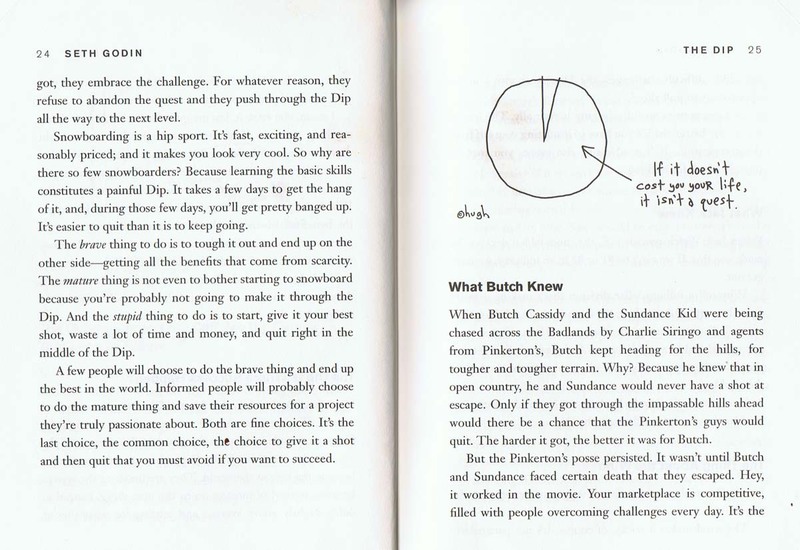 Bottom line: if it's worth doing, there's a Dip. Only a tiny bit of the market is looking for the brand new thing. Most people want the tried and proven thing. The Microsofts of the world hang in, going from version 1 to version 2, knowing that by version 3 they will have slogged through the Dip. MS failed twice with Windows, four times with Word, three times with Excel. 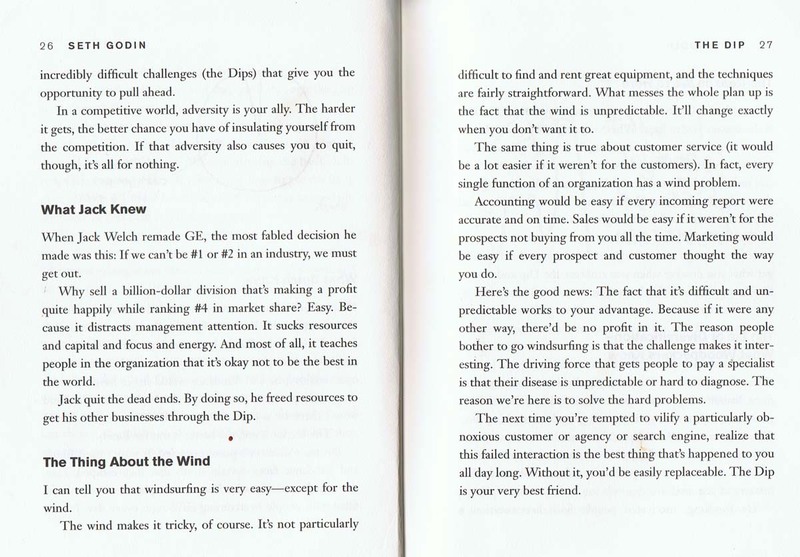 The whole process is based on relentlessly changing tactics but never quitting the big idea. The market wants to see you persist. It wants to know that you are serious, safe and trustworthy. There are times to quit, and there are opportunities to break through the problem with a new strategy. 1. Decide in advance. Marathon runner - "You don't want to be running and start to think 'My leg's sore, it's cold, I'm tired'. If you make a decision based on how you feel at the moment, it'll probably be the wrong one." 2. Pick your market based on your resources. If you find that you can't get heard over competitor's message then you're in wrong market.